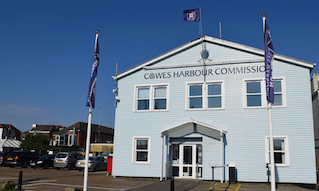 The entrance to Cowes Harbour Shepards Marina is opposite the red No. 6 buoy and the large Union Flag hangar doors at Venture Quays, and leads you into the north and south visitor basins. 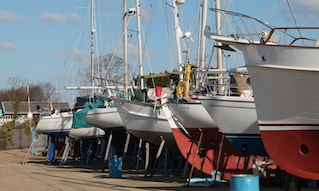 We have painted all the outside piles blue making it very easy to identify the marina. 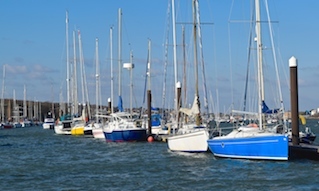 Visiting and short stay boats are required to moor in the north and south basins or on the outer pontoons. 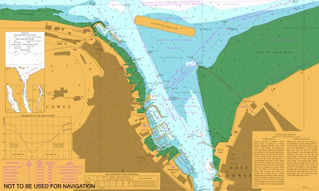 The resident pontoons are marked B, D, A and C and we have the Dry Sailing basin in the northeast corner. Toilets and the marina reception are situated in the far western part of the marina compound. Additional help for when visiting the marina can be found in our Directions to Shepards.